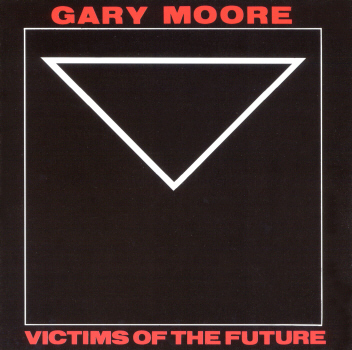 Because of the shocking news of the untimely death of guitar hero and singer Gary Moore, I changed my mind about this week´s classic album and picked up my copy of the 1983 released Victims Of The Future. As most of you will know, Moore has been involved in a lot of bands, (Thin Lizzy and Colosseum to name a few) but was also very successful under his own name. To pick an album that represents his career is impossible, as he did a lot of things. But for me he excelled at making high quality hard rock, that is why I pulled this one out. The last decade or so he picked up on his blues roots again, and again achieved considerable success. To me, he was one of the best rock players around. Starting with the title track, with that chorus that will never leave your mind. It is a a soft intro leading into that hard rocking track with one of his signature solo´s. Next up is Teenage Idol, which is blues infused, but melted into a pop formatted rock song. Shapes Of Things To Come is another stand out song. again a chorus and riff to die for. Let alone another guitar solo that a lot of us will be able to whistle along. I don´t think many people won´t know the album´s balled Empty Rooms. Moore recorded this several times, probably in order to find the ultimate version. But this one is already timeless. This emotional song is followed by another timeless hard rock track, Murder In The Skies. Opening with Moore on fire, showcasing his talent for furious fretwork, an inspiration for many. From the closing trio of All I Want (a riff rocker), Hold On To Love (a somewhat lighter catchy song) and The Law Of The Jungle, I like the album closer best because of it´s eastern flavoured arrangement. I know that Gary Moore wasn´t the best singer on the planet, but he was honest. His guitar pyrotechnics often was of another planet. He shall be dearly missed.